At the risk of saying 'Gorgeous!' too often ... it certainly is! I'm glad you give in to photographing such temptations, dear Eric. Can you say Gorgeous too often?! LOL! Now THAT'S a door. I love that you just shot it straight on—fantastic composition, Eric! And I hear you could soon see it for yourself! Wonderful photo! I love that red door! No. Really what I want to do is visit all the things you've shown us. I want to try those doors and see what's behind them. 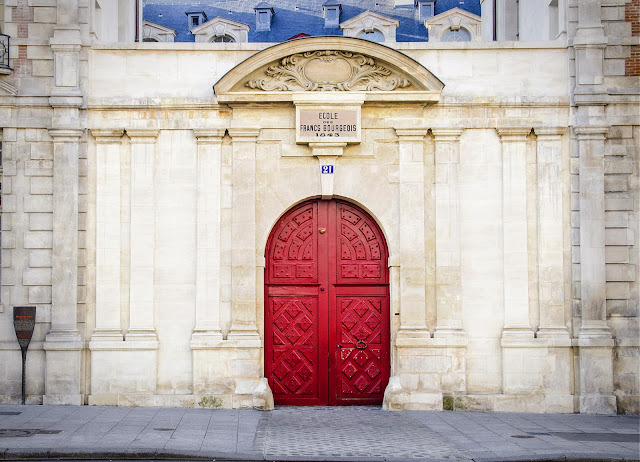 I want to witness a Paris sunrise through the archways of the Palais Royal. I want to be in the crowd on the Champs de Mars on Bastille day. All of it. All of it. It's easy Petrea: come to Paris! Have a nice Thursday in a sunny busy Paris. it is beautiful! & I couldn't help noticing your photos color combo; red, white & blue.